Global architecture group CallisonRTKL said steady progress was being made on the 263,430-sq-m Sheikh Jaber Al Abdullah Al Jaber Al Sabah International Tennis Complex, which is expected to elevate Kuwait to be among the Middle East’s preferred destinations for the international professional tennis circuit. Planned to open later this year and draw some 11 million visitors annually, the new 264,000-sq-m complex sets a new standard in the planning and design of sport-driven districts, said a statement from the company. 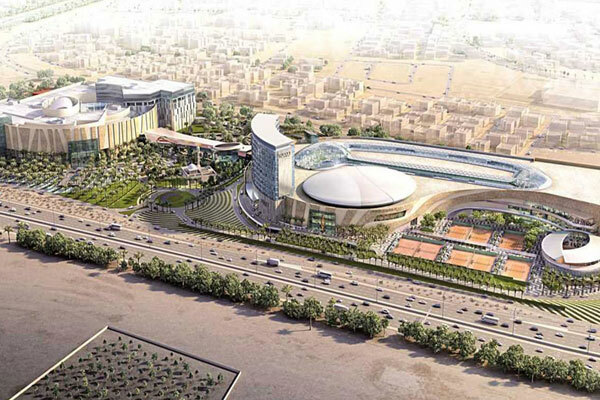 A major brand of leading design and consultancy firm Arcadis, CRTKL said it had designed the complex to include the headquarters of the Kuwait Tennis Federation as well as eight open-air courts; a 5,000-seat covered multi-purpose arena; a 1,600-seat centre court; a fitness centre; a five-star hotel; retail and dining venues, and ancillary facilities. "We approached this exciting project with a clear understanding of its unique context and diverse program," explained Brendan O’Grady, the vice-presient at CRTKL’s Dallas (US) office. “As the designers of 360 Mall, which is connected to the complex via a pedestrian bridge, we know the value of creating a recognisable icon for Kuwait City. We expect this complex to set a new world standard for these types of multi-use districts," he noted. From the very start, Tamdeen Group, the project developer, had set a bold vision for the Sheikh Jaber Al Abdullah Al Jaber Al Sabah International Tennis Complex - to put Kuwait on the map for world-class tennis through great design, quality mixed-use development and superior operations, said a top official. "Through this tennis complex, we will provide a fertile sports environment for training Kuwaiti athletes to excel in international sports," remarked Tamdeen Group chairman Mohammed Jassim Khalid Al Marzouq. "Today we have reached advanced stages in building this creative sports monument, which will put Kuwait and its championships on the international sports map," he stated. The venue, he noted, will be home to the biggest international tennis academy in the Middle East in co-ordination with the Kuwait Tennis Federation, giving Kuwaitis access to world-class facilities and coaches as tennis continues to gain popularity throughout the region. CRTKL said its design relies on curving, organic lines that stand in contrast to the bolder edges of contemporary sport. Natural elements like water, trees and abundant landscape create a calming effect throughout and reinforce Tamdeen Group’s commitment to creating vibrant, sustainable environments that enrich the community and celebrate Kuwait’s position in the world. "The design team is especially proud of a 'living wall' that is composed of more than 101 species of plants - one of the largest of its kind in such a setting," explained O’Grady.